In 1987 the BBC launched the Young Musician of the Year competition. 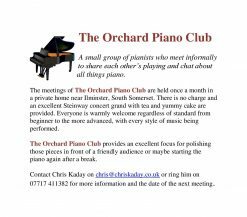 I suggested at a Weymouth Music Club committee meeting that we might start something similar locally. This was agreed and Weymouth Music Club gave £200 backing to get it started. The first Weymouth Music Festival in 1988 attracted 100 entrants. 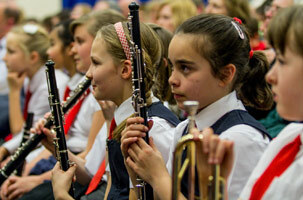 Anyone could enter, all ages, either as individuals or in small groups, large choirs or orchestras for a small fee. It was to be a non-competitive festival and there were no marks or grades. Any kind of music was to be performed, not just classical works. All the known private music teachers were contacted as well as all the state and private schools. The Festival took place at Weymouth College and a concert a week later at St John’s Church. In 1996 there were 175 entries involving over 1000 people taking part. In recent years numbers have been declining – perhaps due to the increase in other music festivals or the onset of the computer age. Some of the entrants over the years have gone on, partly due to their taking part in the festival, to take up music as a career and achieved national and international fame including Duncan Honeybourne, Louise Savill/Dukes, Jack Duxbury, Fiona Dalzell, Christina Ball. In 2010 Ed Hintze took over as chairman of the Weymouth Music festival after the remains of the original committee retired although I still take an active part on the new committee. The Festival ran for 3 years under Ed’s chairmanship but with pressures of work and performing, Ed stood down after the 2013 Festival. The aim of the committee is now to restore the Weymouth Music Festival to its former glory. The Festival is still non-competitive and open to all. I am sure that the Weymouth Music Festival will continue to encourage local musicians for many years to come and may again be a starting point for a future concert performer.